Romeo Rodriguez (center) of Middle Township after winning his 100th career match on Friday against Red Bank. Middle Township's Parker Smart (top) works over Red Bank's Ansel Bryan en route to a win by fall in the second period at 113 pounds. 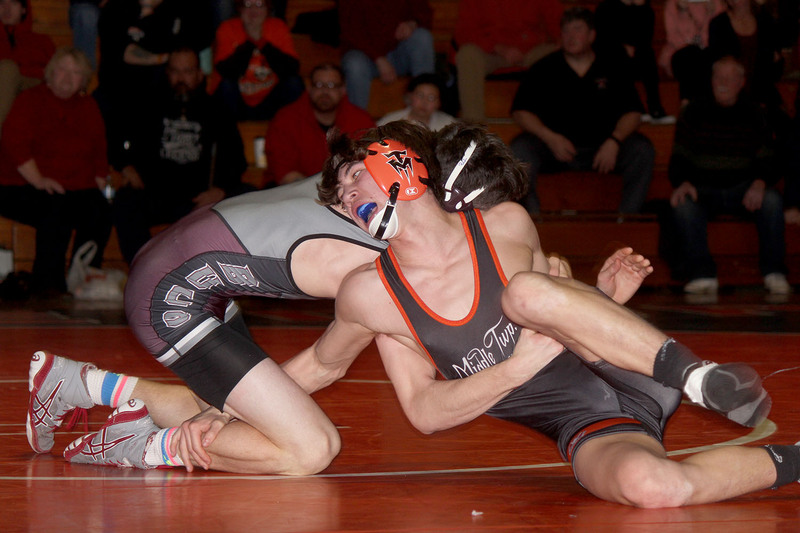 Middle Township's Alick Killian (right) tries to fight off a takedown attempt by Red Bank's Phil Stolfa at 120 pounds. Middle Township's Evan Dugan tries to spin out of the hold of Red Bank's Anthony Ciccone. Kyle Matthews of Middle Township works on Red Bank's Nicholas Principe at 195 pounds. Matthews won a 14-5 decision. Middle Township's Dawson Tallant pushes the back of the head of Red Bank's Justin Gooding in the heavyweight bout. Tallant won a 7-2 decision. CAPE MAY COURT HOUSE — Romeo Rodriguez never wrestled before attending Middle Township High School. But he’ll graduate from there as one of the program’s all-time greats. 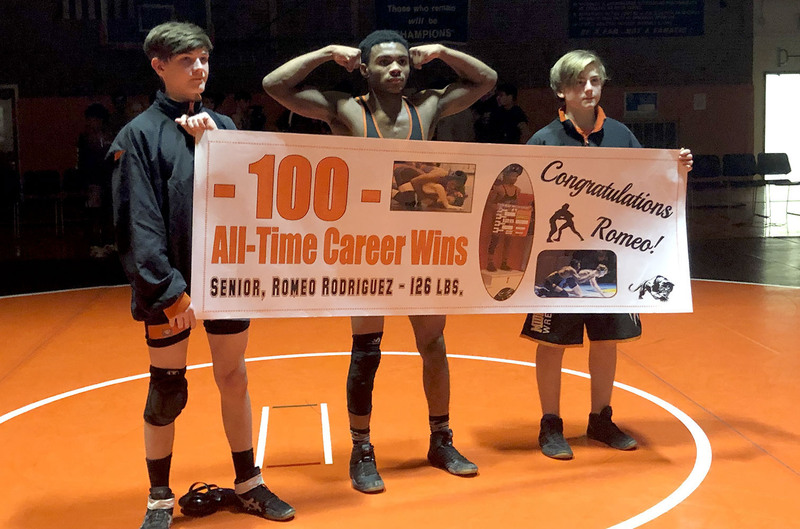 Rodriguez further cemented the legacy of his remarkable rise as an athlete by winning the 100th match of his career in Middle’s 58-15 victory over Red Bank Regional Friday evening. Rodriguez did his best to try to secure the milestone victory with a pin but had to settle for an 18-3 technical fall over Tucker Cochrane at 132 pounds. Rodriguez usually wrestles at 126. The victory came on Middle’s Senior Night. Rodriguez, Carson Haas, Kyle Matthews and Dawson Tallant were each honored. Rodriguez improved to 29-1 on the season with the victory. The 2018 District 30 champion went 38-4 as a junior and 22-15 as a sophomore after beginning his career with a rather pedestrian 11-13 season as a freshman. Middle’s three other seniors also won against Red Bank. Haas need just 22 seconds to win by fall at 152 pounds, Matthews posted a 14-5 victory at 195 pounds and Tallant scored a 7-2 decision at heavyweight. Parker Smart (106), Cole Miller (138), Matt Gariano (145), Karl Giulian (182) and Marcus Hebron (220) also each won by pin and David Giulian (160) won by major decision for Middle, which improved to 12-2 in dual matches. 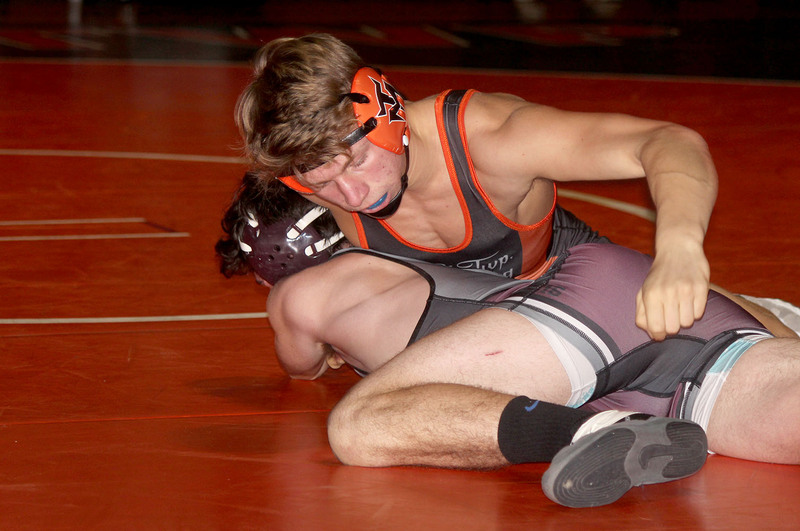 It was an impressive team effort against a Red Bank team that had entered the match at 12-7. “This was the best we’ve wrestled all season,” Wolf said. “We’ve been going two-a-days all week. The kids have been coming in at 6 in the morning and then we’ve been going again after school. We had an optional 6 a.m. practice the other day and every kid showed up.